And of course, they provided wine of all variety. With the champagne open and the guests starting to arrive, we quickly laid the table, lit a few candles and put on the best christmas tunes to get us all into the festive spirit. By 8 o'clock everyone had arrived and I somehow managed to produce all of the roast dinners, on time and still hot. There were sprouts galore and enough meat for 20. I have to say a specific thank you to my lovely friends Tilia and Naomi, who provided both an incredible dessert and a vegetarian alternative, taking a bit of the stress off my hands! Some of us hadn't seen each other since the last Christmas meal and it was so lovely to catch up on each others lives and reminisce on our school lives. 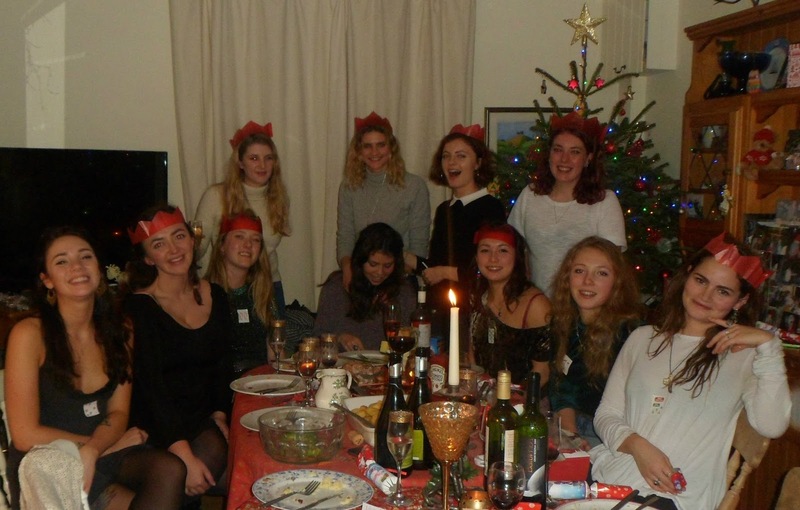 This is our third Christmas meal since we all left school, but because we're all over the country (and world!) we never tire of things to talk about! And once we'd stuffed ourselves full with dessert, we headed out to meet the male-half of our friendship group and catch up with all of them! HUGE apologies for my failure of blogmas, it always seems like such a good idea and I do love blogging but it's so hard coming home, all I wanted to do is embrace the real life bits rather than have a camera glued to my face the whole time!